I received the M5Stack Core development kit last week. I’m quite excited about this, and would like to share my thoughts on it. The kit is based on Espressif ESP32 microcontroller. It is a System-on-Chip (SOC) microcontroller that is becoming extremely popular. There are great reasons for this popularity. The chip includes Wi-Fi and Bluetooth connectivity, connectivity that is very relevant for modern projects. Another important reason for the popularity is the availabiltity of free development tools. GCC based compilers, Arduino, Micro Python, etc are all available. However, the most important reason for the popularity is the low cost. Chips, modules, and development boards are readily available at low cost. M5Stack is a great awesome development platform. It enables the development of aestheticly-pleasing prototype with little effort. It may even be ideal for low-volume production. The modular stackable expansion system is quite ingenious. Custom circuit is “stacked” at the bottom of the kit. The circuit can then be enclosed with relative ease. The difficult task of enclosing the user interface elements (screen, buttons, etc) have been done for you. on/off – reset push button. Overall, the M5Stack is a very nice development platform. The team did a great job. Attention to detail is self-evident — the hardware, the software, the user manual, the packaging. 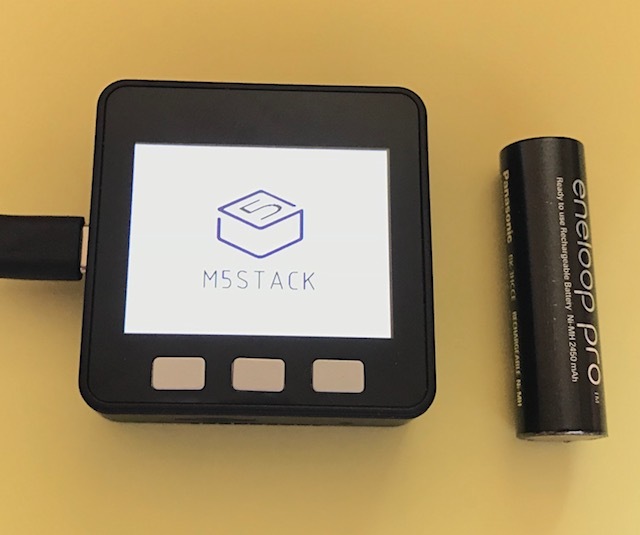 The M5Stack is a great prototype platform. This entry was posted in Electronics, Firmware Development, Review and tagged Electronics, M5Stack, Review on October 13, 2017 by stephen. After unpacking, nothing happens when pressing on the on-off button. So, maybe the battery (hints of a battery on some websites) needs to be charged before use? how long for? what will be the use time once charged? If connecting to a pc usb, something appears on the screen: seems to be gps? motion sensing? could be cool but what is it really? can it be kept? will it be deleted once loading some code? All in all, no information on what you get.